Topdon TD309 Car Code Reader, OBD2/EOBD Diagnostic Scan Tool. 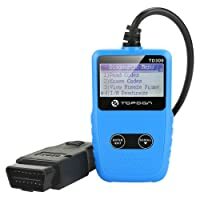 Topdon TD309 Scanner will help you save some money and fix basic problems in your car. No matter if you’re a beginner, DIY-er, or an average car owner, you can benefit from this code reader. Thanks to OBD2 code readers, anyone with a decent knowledge about vehicles can find out what’s wrong with their car. OBD2 code readers do “basic” functions, such as reading and erasing codes. This is enough to fix the problem on your own and keep your car in good condition. 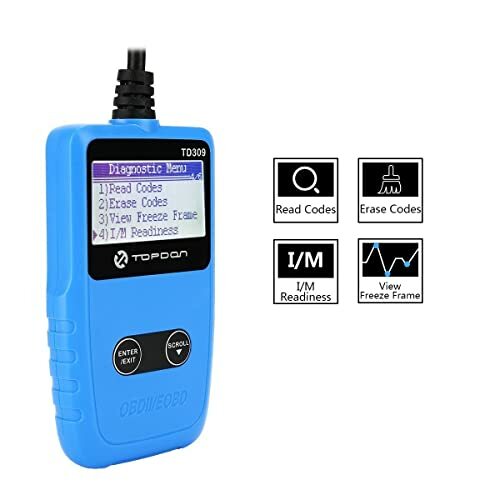 The Topdon TD309 code reader performs basic functions such as reading and erasing DTCs. With its wide-ranging vehicle compatibility and ease-of-use, this code reader is a real pleasure to use. In addition, the scanner is lightweight and compact. So you can keep it in the glove compartment or in your toolbox. Compatibility: The first thing worth mentioning is the extensive vehicle compatibility. 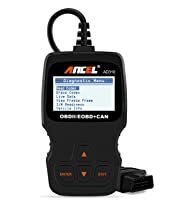 This code reader works with most 1996 US-based, Asian-based, EU-based cars as well as with 2000-European cars. Some of the vehicles this unit works with are NISSAN, Toyota, Honda, VW, and Lexus. As for protocols, this code reader supports all OBD protocols (ISO9141, KWP2000, J1850 VPW, J1850 PWM) and CAN. 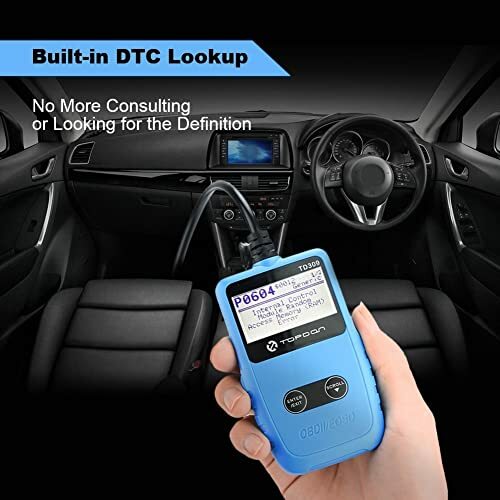 Reading and erasing DTC (diagnostic trouble code): This means that the code reader will find out what the problem is in your car. The half of the work is done when you know what to fix. DTC Lookup: Speaking of fixing, the DTC lookup will help you with that. Thanks to this feature, the code will be explained in plain English. Hence, you will know what to do. Thanks to the built-in DTC lookup, the code will be explained in plain English. Turning off MIL (check engine light): You know that annoying engine light that keeps flashing over and over again? What’s worse, you’ve tried everything in your power to turn it off, and nothing happened. Well, the Topdon Code Reader will take care of it (hallelujah). Turning off MIL is another great feature this unit has. Viewing freeze frame data: You’ll have access to data that was stored when a certain code was set. Interface: This unit ensures a basic way of communicating with your car’s onboard computer. 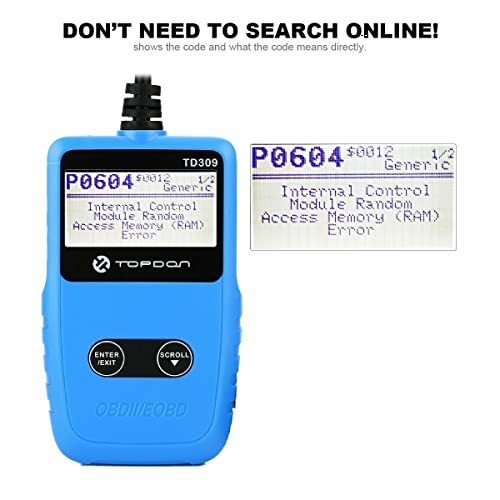 The Topdon Code Reader makes easy work of obtaining the VIN. Thoughtful design: With 4.3 x 2.6 x 0.7 inches and 8.8 oz. this scanner is very compact. Also, it’s well-built and sturdy. That makes it great for carrying with you wherever you go. Simple to use: The Backlit LCD screen and two buttons (enter/exit and scroll buttons) ensure you ease-of-use. Reading codes is easy and clear, even in the daylight. The buttons are responsive and well positioned. The buttons add up to the simplicity of this unit. TD309 is powered by your vehicle, so you don’t have to carry batteries with you. This makes your trips worry-free. You can keep this unit in your tools box, and when needed; connect it to your car. Speaking of that, you get a 100cm long cable with this code reader. 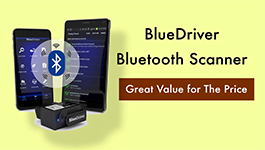 So, you won’t be limited by a short cord when scanning your car. If you aren’t sure whether this reader is something you’d like, don’t worry so much. It comes with a 12-month warranty. Better yet, in the first 3 months, you can return it and get a refund. If this won’t give you a peace of mind, we don’t know what will. Perhaps polite and knowledgeable customer service? Well, it seems this is your lucky day. If you buy this code reader, you’ll have the support of online customer service whenever you need. So, there’s nothing for you to worry about. The Backlit LCD screen and two buttons (enter/exit and scroll buttons) ensure you ease-of-use. 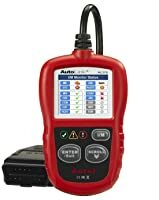 Compatibility: Basic code readers, such as this one, don’t have the ability to cover every protocol from every car manufacturers. Because of that, you have to check your car’s protocol BEFORE you buy this unit. No update: Since this unit is basic, it’s not updatable. That means it won’t keep up with the protocols changes. OBD2 scanners for professional use support all 10 service modes. Taking into account the price and functionality of this unit, it’s designed for home use. As mentioned, this code reader only read and erases codes, views freeze frame data and turns off MIL. TD309 is powered by your vehicle, so you don’t have to carry batteries with you. Reads live PCM data stream. Slow tech support. No in-built DTCs Lookup library. Bottom Line Topdon TD309 is designed and built for any beginners who want to turn off the MIL. ANCEL AD310 focuses on beginners who want to turn off the CEL. Autel Al319 is built for beginners who want to turn off the CEL and do simple diagnosis. Topdon TD309 is a good choice for beginners, DIY-ers, and average car owners, due to its basic functions and a simple design. Well, that would be all about the Topdon TD309 Code Reader. This unit offers basic functions, is portable and affordable. You may find that with another code reader. However, there is still a 1-year warranty and great customer service, making this code reader a trustworthy choice. We hope you enjoyed this brief review, stay safe folks! In this article, we will review both the strengths and weaknesses of the best bidirectional scan tools so that you can choose one that best fits your needs. With Tire Pressure Monitoring System (TPMS), you can avoid accidents related to under-inflation or worn out tire. Check out things about TPMS now. The Review of the Best Midtronics Battery Tester: Special Features – Coverage – Pros and Cons – Who is it for – Comparison Chart.